Prior to this fourth game we were informed that there would be a cut-off, meaning that there wouldn't be a fifth game for us as it didn't really matter all that much. Only the tables that competed for the Podium would be played. I didn't stand a chance at that after loosing twice in a row, so, a bit annoying, but i got even more determined to finish the tournement with a bang. Facing me was Robin and his Tanith/Baldur2? pair. 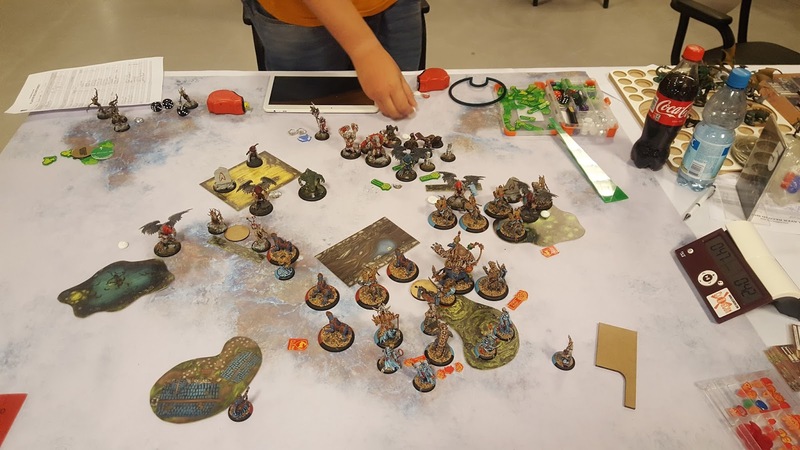 He had played against my list several times before as he regularly plays against Johan (Who i tweaked the list with in the weeks prior to Clogcon), but didn't really feel comfortable because of that. The decision to drop Makeda was Easy. No Una2 and no Kromac makes kitties happy. And in return, i got Tanith. Game on! I haven't played much against Griffons before (At least not the Circle kind), but after dojoing list for Una2, i know that they can pack quite a punch. And be annoying as hell with their high DEF. I outthreat him by a mile though, and with ARM13, Ferox should massacre them if i can just land some hits. Scenario was Take and hold. Robin won the Roll Off, but decided to let me start as he wanted to stop me from getting a side where i could park Makeda behind a Wall B2B with the Flag. I want to start Scoring ASAP, so i deploy slightly skewed towards my flag. The Void Spirit deploys opposite his flag for contesting Duties. He deploys most of his Griffons opposite my flag, the rest is fairly central. Sentry stones on either flank. I Figure i'm really not all that afraid of the Sentry Stone Sprays by themselves, and i reall want to put the pressure on him earle, so i run everything up quite far. Storm Rager on Radheim. Gobber Chef use comfort food to kill two Mannekins, Neat trick. Mannekins andvance and sprays, Damage is irrelevant. The rest of his stuff move up.Star Crossed isn't up yet. Makeda moves to the flag. Without Star Crossed, i don't see the need to Feat just yet. Despoiler moves up to block her off a bit and be more in play. 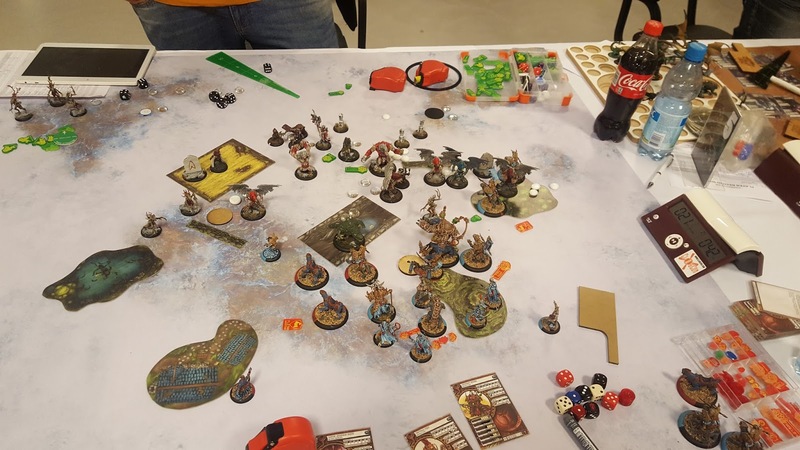 Krea casts animus to keep her safe from shooting. 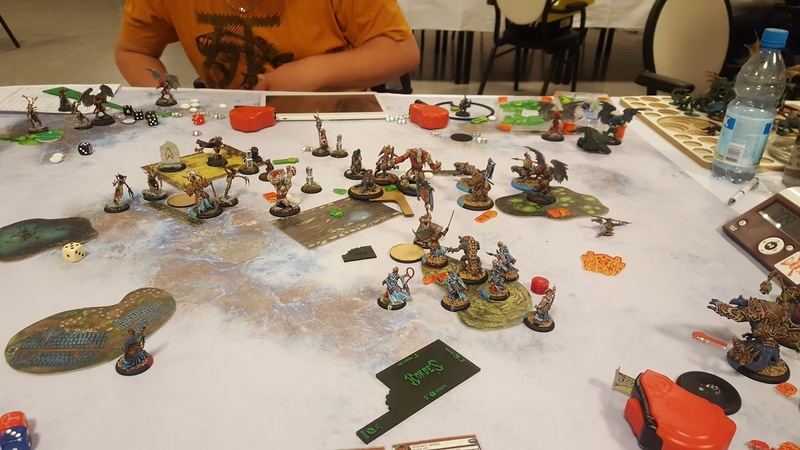 Blue Ferox advance, leaving one bird on one box, and dealing a bit of damage to the other. I fail to kill the right Sentry stone though, leaving it on one box after i flop my damage rolls. 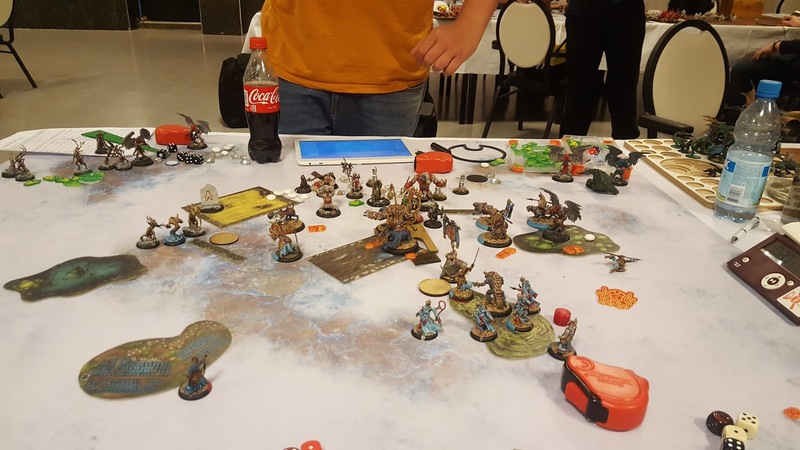 Red Ferox Consolidate their position, one of themkill a mannekin and contests his flag, while also being annoying behind the wall. Void Spirit moves up behind it. He commits heavilly on my right flank, killing Five cats (Three on the right witha ton of birds, one with Snapjaw who charge in to contest, and one with Shooting, Sprays and a bird. He spends a lot of time doing so however. His only chance now is to pass the threshold check on the Griffon and have miss the Free strike with the beasthandler. He pass the check, but i roll the 8+ needed to hit and kill it. The Gorax Frenzies and kill a Beast handler. and his remaining pieces can't really do any damage to me. 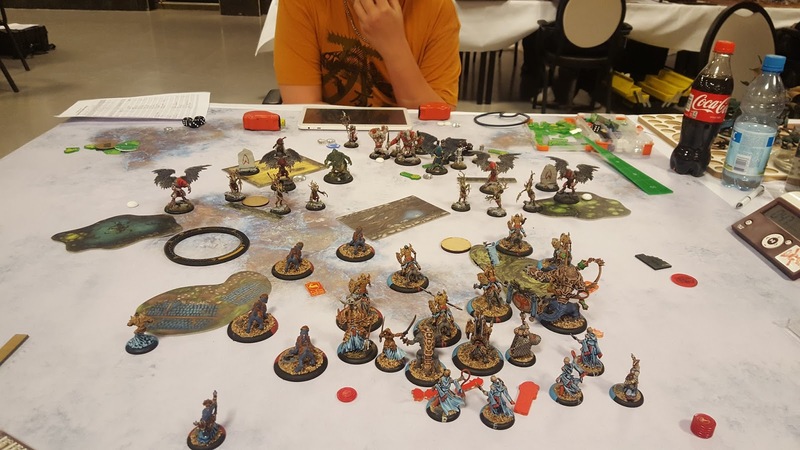 A close fought game, but the attrition strength of this list shows again. It's amazing how strong Stay Death gets once the game progresses, and your opponent have fewer and fewer pieces to deal damage with. I'm really happy with how this game turned out. I made a plan, went with it, and it all panned out just as i had hoped. Another great opponent, and a really good end to the Masters Tournement (Even though i ofcourse wished that i would have had the chance to play for the finals. 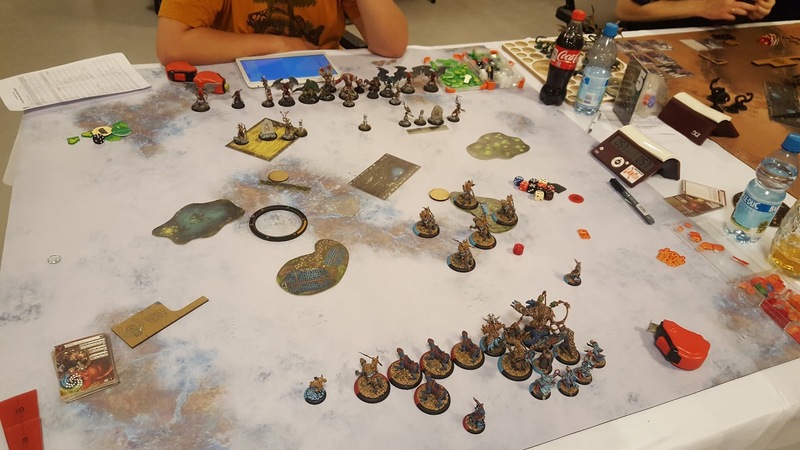 No matter what i'm really happy with how my first major tournement outside of Norway panned out. It was pretty late in the evening at that point, and most of the Norwegians taking the trip had nothing to do on Sunday. There was only one Singles tournement (The Invitationals), and only one of us was qualified for that (Jarle). 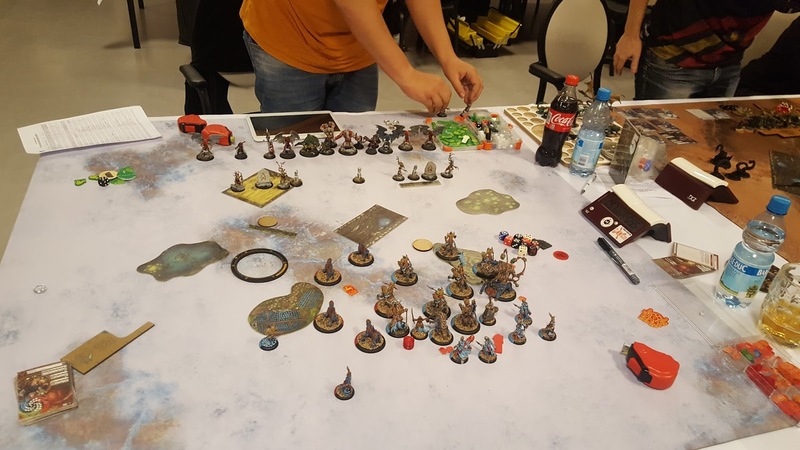 There was some talk about setting up some additional team tournements to give the remaining players something to do. 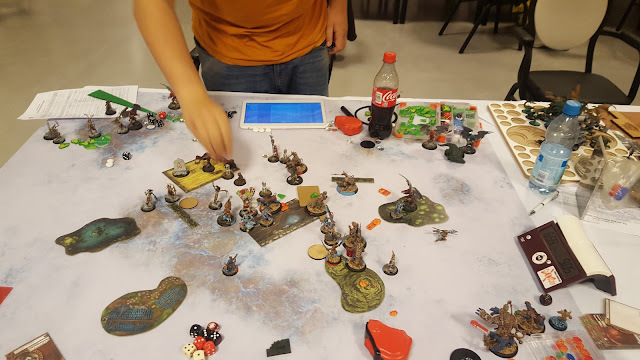 I ended up teaming with Nico (Ret) and Tor Egil Cygnar). We talked a bit about how to approach pairings, and figured out that Makeda is insanelly strong in a three man team setting. It's so easy to pair her into good match ups, and even easier to avoid the bad. And when you take into consideration how strong Retribution and Cygnar are, we had a pretty strong team. The team name was obvious..